Get the View from the Top with a Double Deck Trade Show Exhibit. Exhibitsusa. For the biggest impact at your next trade show, consider double deck exhibits. 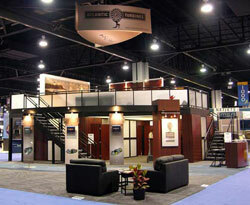 Attract attention, gain prestige among clients and save space – all with a multi-level trade show exhibit. If traditional island trade show displays just don’t pack enough punch or you need more room than your convention space allows, a multi-level trade show exhibit may be just the solution you’re looking for. Featuring upstairs space ideal for a small conference room or lounge for entertaining clients, multi-level trade show displays offer a level of prestige and privacy rarely seen on the trade show floor. And while these one-of-a-kind displays are more expensive than a standard portable trade show exhibit, they also offer several advantages. Read on to learn more about this type of trade show displays. Who should consider double deck trade show displays? Increased square footage provides additional space. High-impact look adds prestige and builds your brand image. Controlled access to second-level rooms creates privacy, allowing for exclusive, preferential treatment of clients or VIPs. Added visibility and sheer size put your brand and marketing message in center stage, creating a memorable, buzz-worthy view from the aisles. Custom double-deck booths are scalable and can be modified into 10×10 displaysor 10×20 displays for versatility. In short, if you want to attract attention and make a statement in your industry—and need additional space and privacy as well – a multi-level trade show display may be right for you. What should I consider before buying a multi-level booth? Overall cost, including not just the purchase price, but fees for transportation, material handling, installation fees, maintenance and storage. The time necessary to install a double-decker booth, as well as additional requirements at shows, such as fire codes. More management time for on-site fire checks, in addition to costs for fire extinguishers and detectors. Additional electrical to power second-floor equipment. Care must also be taken in designing the electrical plan in order to run (and hide) wires through posts and ceiling. To help minimize these time-intensive and costly considerations, we recommend you use standard shapes and styles in your multi-level booth, as opposed to completely custom displays without standard dimensions. This will help avoid difficulties and delays. 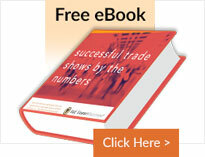 What do I need to know about double deck trade show exhibits? Ask whether the ceiling height of the convention hall will fit a standard double deck, which is usually 16 to 18 feet high. Be aware of city-mandated fire regulations, which may require smoke detectors, sprinklers, fire extinguishers, and/or 24-hour fire protection agents. Before the show, be aware that a fire marshal must approve your engineered drawings. Check on occupancy limits mandated by city or fire regulations. For example, the second level on a 20×20 island displays usually have a maximum capacity of nine to 12. Double deck exhibits are a great option for companies looking to make a big splash at industry events. At E&E Exhibits Solutions, we can help you decide whether they’re right for you—and design your new display from the ground up. Since 1994, Daniel Chaddock has consulted on effective trade show exhibit designs and use of exhibits for trade show marketing. He is currently President of E&E Exhibit Solutions, a trade show display company with expertise in custom displays, custom portable exhibits and custom modular displays. You can reach Daniel via email to Daniel@exhibitsusa.com or call 800.709.6935.